Includes buoyancy belt DeltaBells XCuffs Getting Started DVD workout guide and mesh tote. The AquaJogger® Aquatic Fitness System for Women contains chlorine resistant foam equipment for a fun, safe, effective water workout: fitting waist sizes up to 48", the comfortable Shape Buoyancy Belt suspends your body vertically in the water and helps strengthen your core; the DeltaBells hand gear provide an upper-body workout with variable resistance at the flick of a wrist, while the X-Cuffs for your ankles add intensity to your lower-body workout. 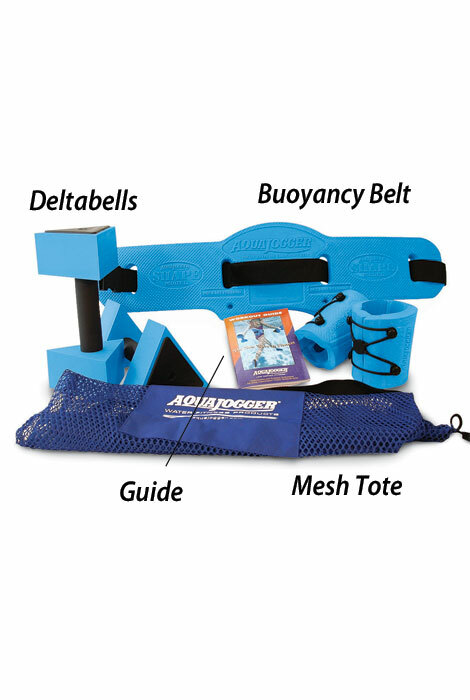 AquaJogger® system also includes Getting Started DVD, Water Workout Guide and a mesh tote large enough for all equipment, your swimsuit and a towel. Blue. to use in our pool. I likes to exercises in my pool and this works fantastically! Try it and you'll see for yourself. I broke my foot and need to get my cardio! to workout in my pool. MUST get into summer shape! Wanted to exercise in the water. I've used it quite a few times, you get a good work out with it! I have a pool in my yard & I love to exercise in the water. The weights for arms & legs should give me a better workout and the waist band should hold me up on the deep end, making some of my workout easier. Served my needs for working out in the pool. 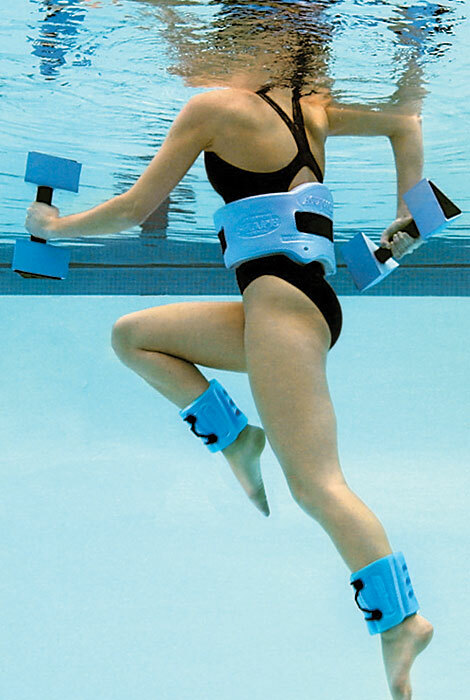 Great for doing exercises in the pool - and not getting sweaty, but getting a great workout! 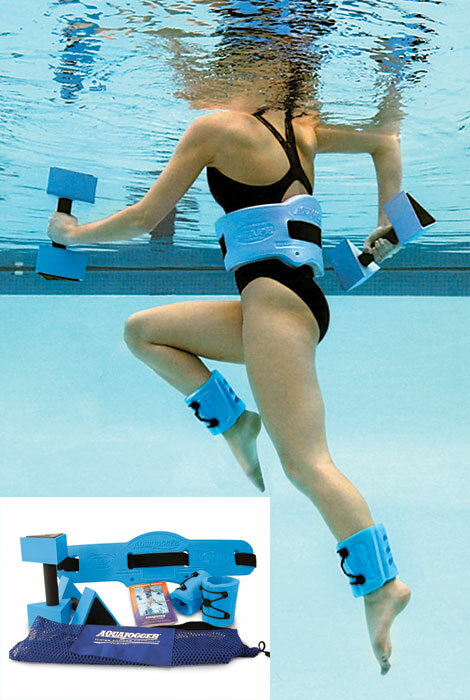 I plan to start an aerobics swim class and needed this equipment. I WILL BE SPENDING A FEW MONTHS AT A HOME WITH A PRIVATE POOL. THIS EQUIPMENT SEEMS LIKE IT WILL BE IDEAL FOR FREQUENT WATER AEROBIC EXERCISES. I think it would be good exercise for me in our new pool. I had 2 back surgeries in 2 weeks due to complications. I did water exercises with PT and this system is very similar to what therapy had. How difficult is it to use this aqua jogger? BEST ANSWER: I found it very easy to use. Sometimes I just use the vest( no hand/feet weights) and jog around the deep end of the pool. Also good for use in the bay. This is my second set as the original one was lost in Hurricane Sandy. Love it! Very easy to use. I had a fracture knee and had to do PT. Used this and it worked like a charm and easier than the PT. I just want the XCUFFS. Do you sell them alone? BEST ANSWER: Thank you for your question. We unfortunately do not carry/sell the cuffs separately. We hope this information will be of help to you.